Adobe has embraced mobile photo editing with open arms, releasing robust apps like Lightroom for processing and perfecting your images on a phone. It hasn’t been quite as committed when it comes to mobile support for video production, which is why it’s nice to see its four-year-old Premiere Clip app being eclipsed by its new Project Rush which merges parts of Premiere, After Effects, and Audition into an all-in-one video app that lets producers master videos right from a mobile device. If you’re unfamiliar with Adobe’s desktop video production tools, Premiere Pro is its video editor, After Effects is a visual effects and motion graphics tool, and Audition is a multi-track editor for audio. Together they cover all the angles of video post-production, but to date have been only available for Macs and PCs. 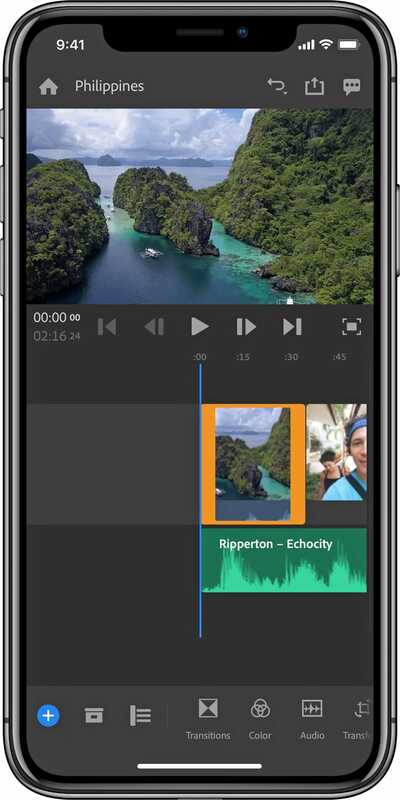 Back in 2014, Adobe released a streamlined version of Premiere for Android and iOS devices called Premiere Clip, but Project Rush is going to vastly expand what content creators will be able to produce from their mobile devices. However, Project Rush isn’t mobile-only. 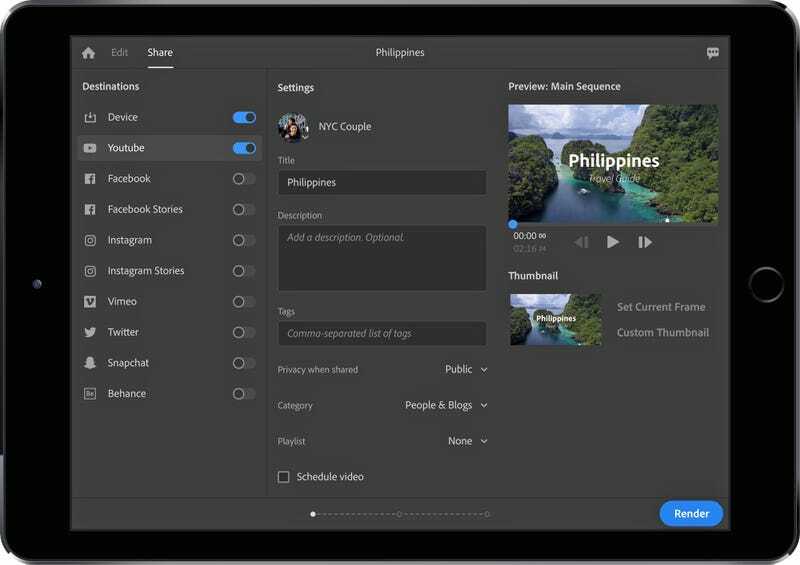 A desktop version will be available as well, and using Adobe’s cloud capabilities, projects will be automatically synced across devices, allowing users to begin editing on their phone, but then finish a project on their laptop. Project Rush isn’t going to replace Premiere, After Effects, or Audition altogether. In order for its UI to replicate itself between computers and mobile devices, the capabilities and interface of Project Rush has been streamlined to accommodate smaller touchscreens. Power users of Adobe’s post-production tools will undoubtedly find a lot of functionality missing in Project Rush, but at the same time, it should boost what users can create solely from a handheld device. Video and audio editing apps have been available for phones and tablets for a while now, so Adobe isn’t breaking new ground there. But complex visual effects software like After Effects has not. During a brief demo of Project Rush it didn’t appear as if the new app had borrowed AE’s powerful compositing and masking capabilities, but advanced colour correction tools was there, as were the motion graphic titling templates that are already available in Premiere Pro. Creating custom animated titles didn’t appear to be an option either—although I’m not sure I’d even want to attempt that on a six-inch screen. When it comes to audio, Project Rush hands the mastering off to Adobe’s Project Sensei which is the company’s AI-powered automation software. Instead of having to process every bit of audio by hand, Project Sensei will automatically mix and master the sound levels on a user’s behalf, which is an approach we’re seeing creep into more and more of Adobe’s products. Rounding out Project Rush’s focus on video-production-on-the-go is the ability to publish or share video content on multiple platforms including YouTube, Facebook, and Snapchat, from the app. This includes the ability to specify custom thumbnails, the title and description of the video, and even scheduling if you find yourself finishing in the middle of the night, and don’t want your masterpiece to hit the internet until you wake up in the morning.